Then he went to see Lisa Jack, an assistant professor of psychology at Augsburg. He said he was interested in psychology, and she asked him why. “I told her I liked watching people and how they operate,” Praska explained. The next thing he knew, they were mapping out a strategy for him to complete the psychology major in two years. 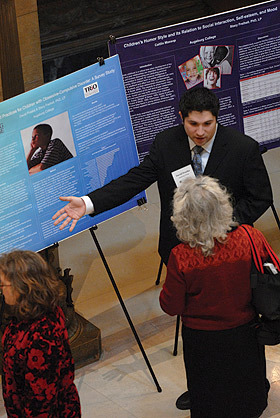 Applicants to graduate school encounter intense competition for admission and funding. The McNair Scholars Program helps increase the odds of acceptance to graduate school by offering students a unique research experience during their undergraduate careers. Participating students spend more than 400 hours exploring topics, developing a thesis, collecting and reviewing data, and preparing a formal presentation of their findings. Research provides the opportunity to develop a mentoring relationship by working one-on-one with a faculty member. Students also gain extensive skills and knowledge in a discipline, experience using methodological techniques, and writing and public speaking practice by submitting papers to professional conferences and journals.